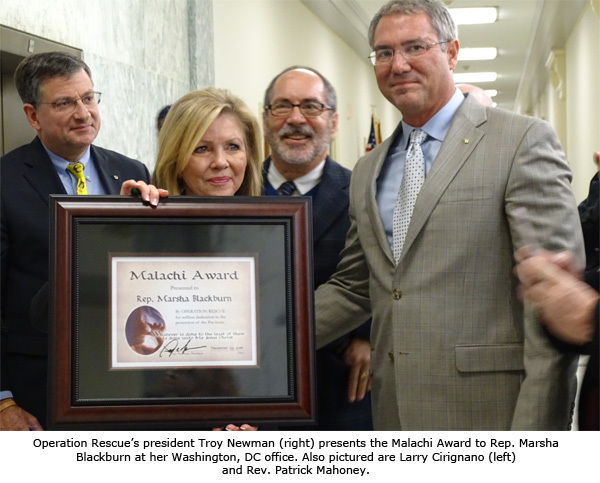 Washington, DC — Operation Rescue is pleased to announce that the recipient of the 2016 Pro-Life Person of the Year Malachi Award is Rep. Marsha Blackburn (R-Tenn.) for her work as Chairman of the House Select Investigative Panel on Infant Lives. Under Blackburn’s leadership, the Select Investigative Panel on Infant Lives made 15 criminal and regulatory referrals to state and federal authorities, seeking further investigations and possible prosecutions of five Planned Parenthood organizations, three organ procurement companies, the University of New Mexico, and three other late-term abortion facilities. “Her Panel’s work provided vindication for Center for Medical Progress journalists, which first brought evidence of Planned Parenthood’s participation in the illegal sale of aborted baby remains to the public in 2015,” said Newman, who served as a founding CMP board member. In addition, Blackburn boldly investigated other abuses related to illegal late-term abortions and the murder in infants born alive during abortions. As a result, her Select Investigative Panel referred Texas late-term abortionist Douglas Karpen to the U.S. Department of Justice and Texas Attorney General for further investigation and possible prosecution for the alleged murder of late-term babies born alive during abortions at his Houston abortion facilities. The Karpen criminal referrals included numerous additional violations that placed the lives of women in danger. Operation Rescue had filed formal a complaint against Karpen in 2013, prompting a grand jury investigation that went nowhere due to political corruption within the county prosecutor’s office.